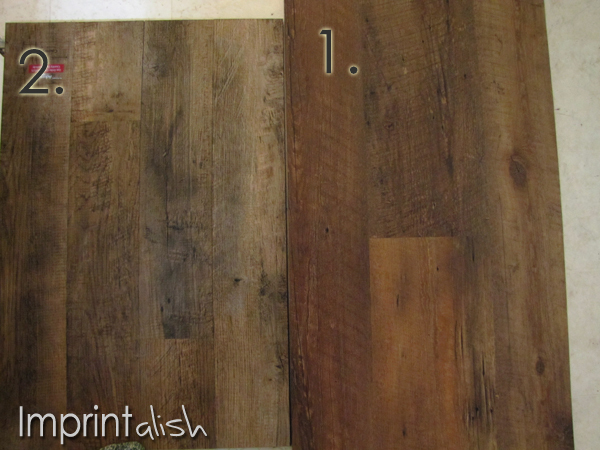 Imprintalish: Kitchen Flooring-Help Me Decide! Number 1 is a Wide Plank and a bit more ridgier (is that a word?) on your foot. It has a warmer tone to it. 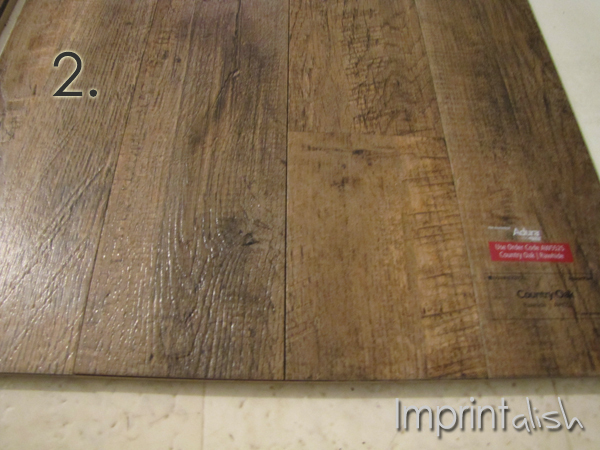 I think it resembles a rustic hardwood more closely then number 2 and is $1.00 more a sq. ft. Number 2 is a smaller plank and has a smoother feel then number 1. It is also a bit ashier in tone. It's maybe a little shinier then the first one too. Problem....we like both!!!! We've layed on the samples, took our socks off, put our socks back on, the kids jumped on them too! Which do you think? One or two? Two or one? I like the coloring of ONE better. To me it seems more finished, whereas TWO kind of looks like worn out wood. I am really weird about wood, I always want it to have a uniform, finished appearance. Otherwise I will want to strip it, sand it, wash it and re-varnish and seal it. 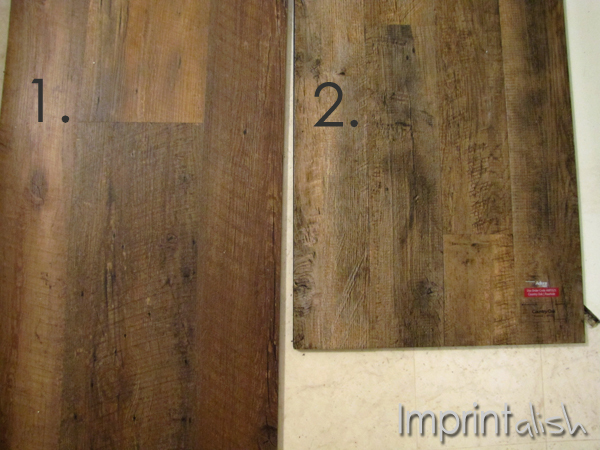 So I would have a hard time with a vinyl flooring that I couldn't do that to! Ha ha ha! I would go with number two. My In-Laws just put wood flooring in and it's more rigid and after having walked on it actually installed it's not as comfy on the feet as you think. I like #2! It just looks more real to me. I like it. Without seeing it close to your cabinets or other wood work, number 1. 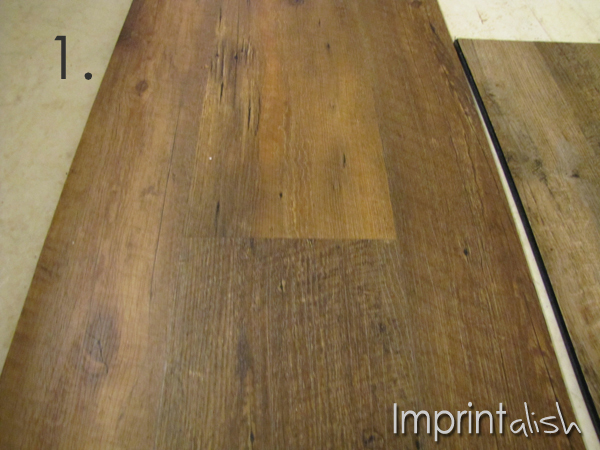 We are looking into wood look vinyl as well. I like those 2 samples you've shown us. I am going to have to go back to the flooring store and see if I can find something like that. I love number one. It's more finished and has such a warm tone and feel. I prefer number one, whole heartedly! I like two!! :) Very rustic feeling! Ohhh pretty! We just layed down hard wood in our kitchen last summer, & we had such a hard time picking one, until... we found THE one! It was like meeting Mr Right! I reaaaaly like #2! It just looks real & worn to me, but I love the rustic look. They both are great. 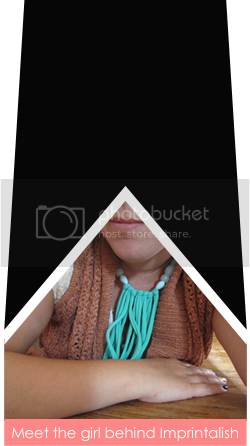 I guess it just comes down to if you want a more worn, or polished look? So dang excited to see your gorgous new kitchen! Number two. The colour will look great with your countertop. Did you try the sample at different places on your floor to see how the light affects it? Sooner or later one will say pick me!! !